Even with a majority, to achieve real reform Modi will need to take account of political realities. The decisive mandate given to the Bharatiya Janata Party (BJP) in India’s 2014 general elections reflects the high hopes voters have in the prime minister designate, Narendra Modi. With “young” India voting in large numbers this time (47 percent of the electorate was under the age of 35), it is now clear that the BJP could effectively tap into that segment’s mood for quick change. Modi’s economic policies – often dubbed “Modinomics” – have been a favorite topic of newsroom debates. To its credit (and thanks to the massive advertising campaign), the BJP has been able to project Modinomics as a magic wand capable of reviving the ailing Indian economy single-handedly. India Inc. has been quick to present its wish-list to the prime minister-designate (often considered a “pro-business” leader) which includes immediate requests such as the introduction of Goods and Services Tax, action to contain subsidies, monetary easing, and fast-tracking of stalled projects. However Modinomics should not be misunderstood as Gujarat’s model writ large; India has a federal structure with different dynamics at the state level. Those who believe in the “Midas touch” theory of economic revival could be setting themselves up for huge disappointment. The new government now has the daunting task of reviving India’s economic growth. Most economists talk about restoring investor confidence as key to India’s economic recovery. Rejigging government expenditure towards higher capital expenditure in the government budget and revising tax slabs (or brackets) to spur household savings could be some immediate steps to set a positive mood. The new government will have its hands full with a to do list that might include privatization plans for public sector undertakings, recapitalization of state run banks, a goods and services tax (GST), amendments to the Agriculture Produce Marketing Committee (APMC) Act and other archaic laws, a favorable agriculture policy, the $90 billion Delhi-Mumbai Industrial corridor project, encouraging foreign direct investment in the insurance and pension sectors, and reviving a national manufacturing policy. If the initial mood is positive, India has the potential to attract greater foreign capital inflows than its peers receive. Within the BRICS, China is slowing with the threat of a credit bubble looming, Brazil’s fundamentals have been hit, and Russia faces its own set of issues. However, moving beyond economics is the key. If the 10-year UPA rule is often referred to as “the lost decade” by the BJP (a debatable assertion), it is pertinent to ask: What can Modi do that his predecessor Manmohan Singh – an accomplished economist himself – could not? While the Modifesto looks ambitious, it fails to highlight how the schemes will be applied nationally. The framers of India’s constitution divided the powers of government into three lists: a Union or Central list, State list, and a Concurrent list. Matters relating to land rights, public health and sanitation, agriculture, agricultural education, irrigation and water use, roads, and local government are on the State List. Other matters relating to population control and family planning, education, minor ports, electricity, and trade and supply of certain basic agricultural commodities have been placed on the Concurrent List. It is this complex federal structure that will post the biggest challenge for the new prime minister, who will enter office to tremendous expectations. While Modi benefited from the structure of the federal polity as chief minister of Gujarat, it will come to haunt him at the national level. The autonomy of the states has many times stopped the national government from pushing through its policies. The biggest example is the land issue (which is on the State List), which has been a major hurdle for the UPA, holding up 90 percent of infrastructure projects. UPA also faced resistance in its retail policy reforms, APMC revision, commercialization of genetically modified food crops, GST, and many other initiatives. It will thus be interesting to see whether Modi can push through these policies and work together with state governments, many of which are hardly pro-Modi. This general election has been unique in many ways. India witnessed the longest, most expensive election in its history, with the highest voter turnout ever (66.4 percent) and a huge youth vote base. Voters have given absolute majority to a single party for the first time in thirty years. Yet the BJP also managed to win it majority with the lowest share of the vote every (at just 31 percent). This last fact, along with the 49 percent of the vote that went to the “other parties” (the BJP and Congress combined won only 50 percent) is all the more reason for Modi to reach out to the regional parties and invite them to participate in his era of “ache din ane wale hai” (from his campaign song, meaning “good days are ahead”). Working with state governments without biases will be his first real test as prime minister. 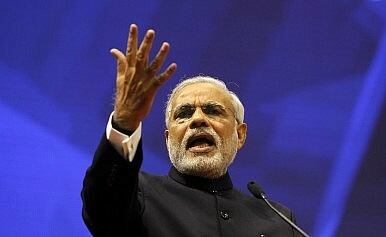 Dealing with India’s federal polity could prove to be what makes or breaks Modi as prime minister. While a decisive mandate without the pulls and pressures of a coalition can mean fast-track policies and regulations, as well as an active legislature, a coalition can provide checks and balances. In its absence, the central government under Modi must become a facilitator and a regulator, allowing individual states the choice to participate freely in India’s economic development. Will Investors’ Gamble On Modi Pay Off? Some analysts are bullish on the new prime minister, but he has a tremendous challenge ahead.